Orr drew from the traditions and tall tales of many cultures to design the artwork for BG265. The concert featured Spirit and frequent Fillmore performer, Elvin Bishop. Barely out of high school when the psychedelic scene rocked San Francisco, Orr aspired to become a Fillmore poster artist. 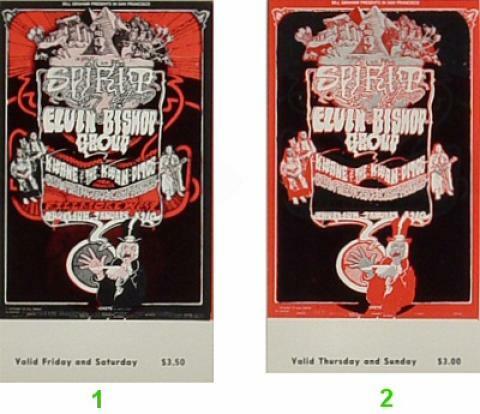 Hired in 1970 by Bill Graham's art director, Pat Hanks, many of his first posters featured detailed lettering on rich colorways and reflected the influence of artists Kelly, Mouse and Griffin. Orr's style evolved to include designs featuring female nudes and photographs combined with complex lettering and backgrounds. His posters are compelling artwork, a mixture of pure public relations and religious or political themes done in jewel-like tones.